Is your existing conservatory looking a bit tired and dated? Do you want your conservatory to feel less like an add-on and more like an integral part of your home? Or perhaps you are considering installing a conservatory but you have concerns about its’ structure. An Ultra Frame tiled roof could be the solution you’ve been looking for. Ultraframe produce a range of replacement roof solutions. From fully glazed to totally tiled, we’ve got the products to match your needs. The UltraRoof 380’s lightweight tiled roof is the most advanced conservatory roof on today’s market. Using the latest technology, the UltraRoof 380 combines the best of a traditional fully glazed conservatory with all the benefits of a brick built extension. You will stay warm in the Winter while keeping cool during the Summer months. A tiled roof from Ultraframe will add value to your property and vastly improve your standard of living. Why choose a tiled roof? Thermally efficient – An Ultraframe tiled roof fully complies with building regulations. It has JHAI system approval which means it has been through rigorous tests to meet the highest energy efficiency levels. Interior benefits – Inside your home, the UltraRoof 380 creates a stunning vaulted ceiling. It is stylish and contemporary, adding class and beauty to any home. An internal pelmet surrounds the perimeter of the ceiling. This can be used to house spotlights or speakers to enhance the room’s atmosphere. Exterior benefits – Outside, an Ultraframe tiled roof looks natural and blends perfectly with most property styles. 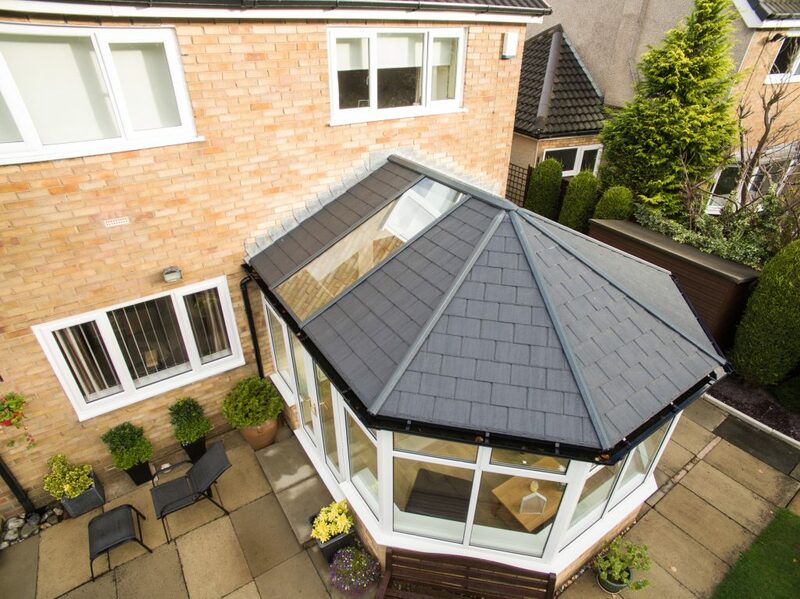 The roof ridge can be capped with aluminium or traditional tiled roof capping. The fascia boards are available in white, black, rosewood or oak, to easily match your existing property’s colour. The tiles are also available in either Carbon Grey, Harvest Brown, or Terra Brick. Glass panels can be inserted into the roof to further increase light intake. Easy Installation – The UltraRoof 380 is pre-manufactured to avoid on-site installation problems. It can be quickly installed to minimise waste and disruption to your home life. If you’d like an alternative to an Ultraframe tiled roof, have a look at the Ultraframe RealRoof and Ultraframe LivinRoof. At Albion Windows, we’re always happy to advise on the best option for any home improvement project.